As a cultural port of call, the local Parisian bakery (boulangerie) can't be beat. Where else can you so easily come face to face with some of France's most esteemed traditions-- ones you can see, smell, and taste? And unlike the city's Michelin-starred restaurants, well out of financial reach for most of us, even the best bakeries and patisseries in Paris offer oodles of delicious items at perfectly reasonable prices. It's democratic, it's delicious; in short, to badly paraphrase the ill-fated Marie-Antoinette: let us have bread. And croissants. And cake. And eclairs. And macarons. You get the idea. However, while it would seem like the simplest of affairs to step into a local boulangerie-patisserie and order away, many visitors to the French capital find the process more than a mite intimidating. How to distinguish between the myriad flutes and loaves you see in the bread section or pronounce those delectable-looking but mysteriously-named pastries all artfully lined up in one of the display cases? What on earth is the difference between those two small chocolate cakes (opera and foret noire) anyway? Print out the following list of typical items found in Parisian bakeries (and elsewhere around France) and you'll be mystified no more. Just be careful not to call a pain au chocolat a "croissant au chocolat"-- a sin that might just win you a stern reprimand and correction from the baker, who's likely to remind you that a pain au chocolat is shaped in a square, not a crescent! Without further ado, let our delicious cultural lesson begin! Baguette: The everyday baguette is excellent in certain bakeries and mediocre in others. It's also among the cheapest items in most places. Baguette tradition: This baguette, ostensibly prepared from a "traditional" recipe, is generally a bit more expensive than the standard one and often features a chewier crust with a heady aroma. It's often worth forking out a few euro cents more for this baguette, especially if you're not visiting a 'creme de la creme' bakery. Flute: This is a smaller baguette-like item that is identifiable by its tapered, pointy edges. Some flutes, named after the instrument for its resemblance to it, are sold in whole-wheat or other varieties. Baguette aux céréales: If you're looking for a healthier baguette with added fiber, or a snack to really fill you up, choose this one, which is made with wholegrain flour and often baked with seeds and grains. Generally hardier and easier to keep for more than a day or two, loaves are ideal for a larger dinner party or picnic. Pain de seigle: A loaf made with rye flour. It's generally not as intensely rye-flavored as Anglo-Saxon or German/Eastern European counterparts since it's often baked with a combination of white wheat flour and rye. Pain de campagne: A heavy, dense, crusty loaf that goes well with meats, cheeses, or served with soups, stews, or other hot meals. It's often baked using a combination of whole grain and white flours. Pain complet: Whole-grain bread in rounds or loaves. Pave aux céréales: Similar to the "baguette aux céréales", but baked in a dense, rectangular block. Pain aux noix: A loaf with nuts, often walnuts. Pain aux figues: This is a loaf made with figs, and often consumed for breakfast, or with traditional dishes like French cheese plates or foie gras. The next step in our Parisian Bakery Items 101 lesson: identifying and choosing delicious viennoiseries. But what on earth does this term even refer to? 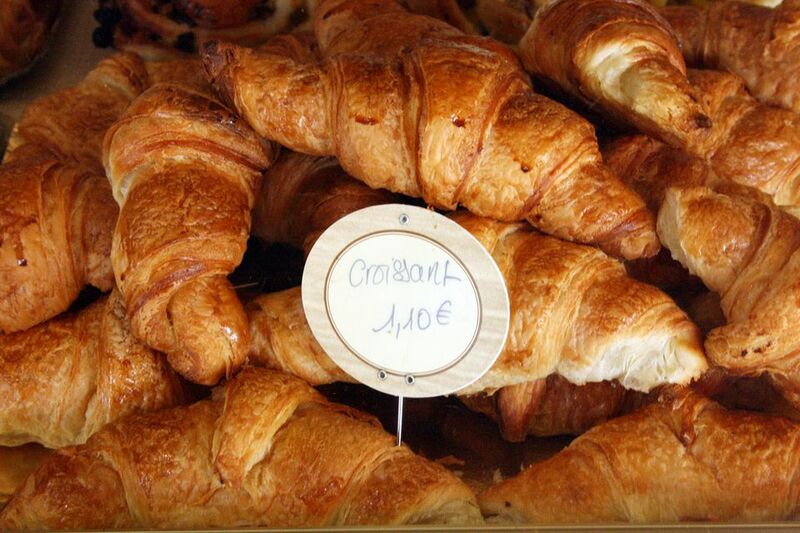 It's a little vague but think of a viennoiserie as a bread-like pastry, most often consumed for breakfast with coffee. Croissants, pain au chocolat, and strudels all qualify. In addition to these familiar items, here are some others you'll find in most bakery display cases- and yes, it's perfectly ok to munch on these in the street. Pain aux raisins: This is a raisin and sugar-laced pastry that resembles a cinnamon roll. It's most frequently consumed at breakfast. Croissant aux amandes: A decadently sweet croissant laced with powdered sugar and almonds, and sometimes, a pastry filling. Chouquettes: Crunchy and chewy, small puff-pastry balls coated in sugar, and often enjoyed as a special breakfast treat alongside other more filling items. Pain brioche: Sweet, eggy bread, most often eaten at breakfast. Similar to the traditional Jewish challah bread. Some varieties come with chocolate chips or crunchy bits of sugar or praline. Pain au lait: An oblong little bread featuring a similar flavor and consistency to brioche. Pain Viennois: Another sweet bread resembling brioche, and named after the capital city in Austria. Chausson aux pommes: Pastries resembling mini apple pies. Last but far from least in our cultural tour of Parisian bakery items, let's take a look at some of the always-artful and usually delicious items found in bakeries and patisseries (pastry shops) in Paris. Sometimes the choice can be overwhelming but remember: a visit to Paris isn't the time for over-zealous moderation. Eclairs: A favorite among many, and light enough to enjoy even after a big meal. Most bakeries offer eclairs in a variety of flavors, including vanilla, coffee, and chocolate. Macarons: Two small round cakes made with almonds, egg white and sugar, pressed together and filled with buttercream or jam. These come in a large variety of flavors of colors. Tarte aux fruits: Individually-sized fruit tarts that come in several varieties, including strawberry (fraise), raspberry (framboise), pear (poire) or lemon (citron). Also look for chocolate tarts (tarte au chocolat). Paris-Brest: Created to commemorate a cycling race between Paris and Brest in 1891, this pastry is made with chou pastry and a praline-flavored cream. Meringues: Large pastries made with egg whites, and usually crunchy and airy. They come in different colors and flavors in some bakeries. Religieuse: This dessert is made with the same pastry and filling as eclairs, stacked to resemble a nun. You can usually find them in chocolate or coffee flavors. Opera: A delicious mousse cake with chocolate and crunchy praline layers, and usually served in a single slice. Madeleines: Oblong sponge cakes made famous by French writer Marcel Proust, and perfect with afternoon tea or coffee. Canelés: This distinctively caramely pastry comes from the city of Bordeaux, and is shaped like a large, ridged gumdrop.